Here is a break from my normally scheduled programming, lol. I found this pair of what I call wanna-be-Toms at Marshalls a few months ago in their clearance section. 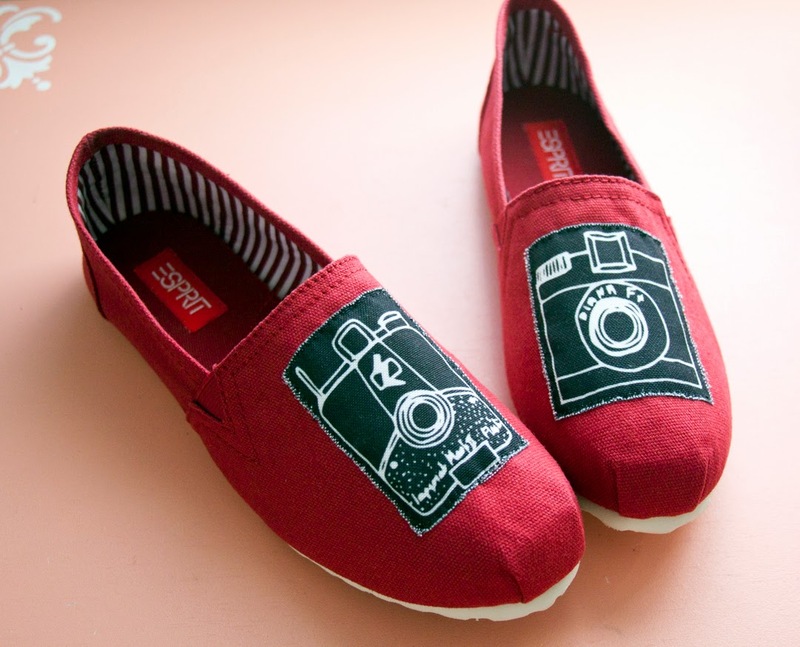 I'd never tried out this type of shoe before (being too cheap to buy Toms brand), but I was always curious on how I would like them. This Esprit pair for $9.00 would be a great chance to try out this style, but even when I made the purchase I planned on embellishing them in some way. I mean what good are plain fabric shoes if you can't make them your own, right? At the time, I just put this notion away in my "good ideas" file of my brain and moved on for a while. Not long after though I found out that Spoonflower was offering a free test swatch of your choice in their new Eco Canvas fabric on that day only. Of course I immediately headed over and looked through to pick out my swatch. I was quickly overwhelmed as they have so many amazing prints to choose from (you could also make your own as part of the promo - so cool). In the end, I went with a category that is near and dear to me: Cameras. 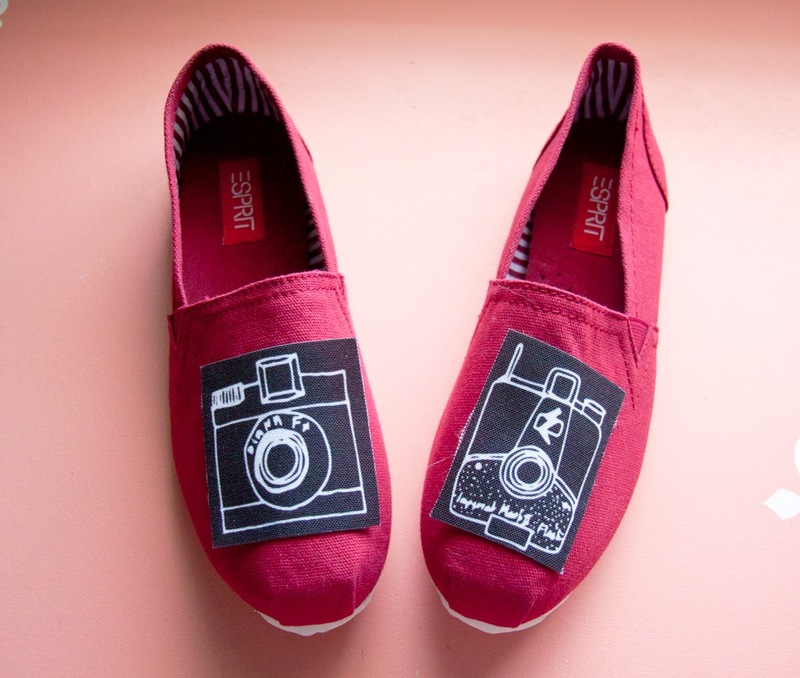 After much deliberation, I decided to use the Diana F+ and the Imperial Mark XII cameras on my shoes. These were two of my favorite cameras back in the day. I had two vintage Stellar cameras (the Diana but with a different name) as well as two Mark XIIs (a black one and a Girl Scout mint green one), and my husband eventually bought me the Lomo repro of the Diana F+ while we were dating (complete with the polaroid back - so cool). I used to love putting 35mm film through the Mark XII - you end up with one long picture due to the overlap of the shots and the picture goes up into the sprocket holes. Anyway, I could geek out on cameras forever - you can see my old work if you go here. After choosing my cameras, I cut them out evenly and put them on the shoes until I liked their shape and placement. Then came a whole lot of hand sewing. No joke I must have spent 2 hours just stitching these things on like patches. I just used a running stitch around the edges in black thread. It went fine until I had to cross the toe - do you know how hard it is to strategically place a needle and push through thick layers of fabric with your needle held between your 2nd and middle finger in a tight area? Pretty stinking hard I can tell you, lol. The whole process did kind of take me back to my high school backpack embellishing days - I had a red Jansport with Weezer and NFG patches as well as an "Arm The Homeless" patch I got at Warped Tour one summer. Classic. Anyway, if you can stitch a patch, you can do this project. I just had to be very patient and constantly reposition the needle across the toe to keep the stitches even from the outside. After doing all this work, I wanted to make sure my shoes would last a while for me to enjoy. I had pre-washed the camera fabric, but I was afraid that the red canvas would bleed into the patches if these got wet (which is inevitable - I live in Florida). Enter a can of Scotch Gard. I had never used any Scotch Gard products before, but consider me a convert :) It was quick and easy to apply (I even did 2.5 coats), and now I have the peace of mind that these shoes won't look awful the first time I wear them out. I know it's a silly little project that any high school student has probably done by now, but I was really happy with how these came out. This was quick to do, and only cost me about $10 when you factor in the amount of Scotch Gard I used. Not bad for a pair of custom shoes!